Howdy gentle readers and other assorted folks! Yes, that was a very optimistic greeting, under the assumption that real people actually read this blog. So why didn’t I blog for such a long time…the reasons are not that complicated. All this time even though I didn’t blog much I have been reading a lot. Yeah in today’s world reading doesn’t necessarily be confined to the world of books as you see in its printed form. I have been following lot many blogs as you could understand from my reading list provided here. Well I have been reading those. Evidently the sorts of experience that you gain by reading blogs are very much different from what you gain by reading ordinary books or journals. As you can make out, the posts that you read in a blog are a person’s own opinion without any bias. One wouldn’t get that feeling when reading a journal or other articles or magazines published online. All other such materials obviously goes through various stages of editing and what we readers essentially get to read might not be the honest opinion of the writer. That makes a very big difference. What we read in a blog is the raw material and feelings that any blogger has without any distortions or other influences. And also most of them are very different in its compilation than what we get to read in journals and magazines. So blogs have always occupied a special place in my life. Well I quite didn’t give the reasons why I didn’t (or rather couldn’t) blog for such a long time. Okay people usually have this feeling that engineering students don’t get spare time and that they are always kinda bookish. But believe me that’s entirely wrong. I have never got this much free time ever in my life before. So lack of time is definitely not a reason . One of the many online revolutions that are currently taking place is in the case of social media. What exactly is the so called ‘social media’? I’m not quite an expert in this subject but nevertheless I’ve been an active member of this social media revolution that’s been taking place in the world of internet. I started off with orkut which most of my other Indian readers also did. Then came this all new phenomenon of facebook which quite had a sweeping effect in all of our lives. So is the case with the micro blogging site twitter. Although facebook has always been having an upper hand over twitter. The main factor which gives facebook its upper hand is obviously its popularity. It has millions of more members than what twitter has. But one could never compare both, as facebook deals with social media and twitter on other hand is a micro blogging site. To be honest my twitter account is sort of newsroom for me. I get most of the news about things happening around the world in my twitter account much faster than I see in television or in any other news media. I could give an example. I hope every one still remember about the devastating earthquake that struck China this year. The earth quake was first reported in twitter. Only after the news broke out in twitter did even the big media houses like BBC and CNN break the news. If there was no twitter the world would never ever have seen the devastation in its complete form that happened as the Chinese government would have easily suppressed the media from publishing the information and details about the disaster. It makes any average person an important contributor. What I’m essentially pointing out here is that these phenomenons not only altered my online experience but opened new vistas of knowledge and information to me. Earlier I used to spend most of the time in net reading blogs and other similar stuff. 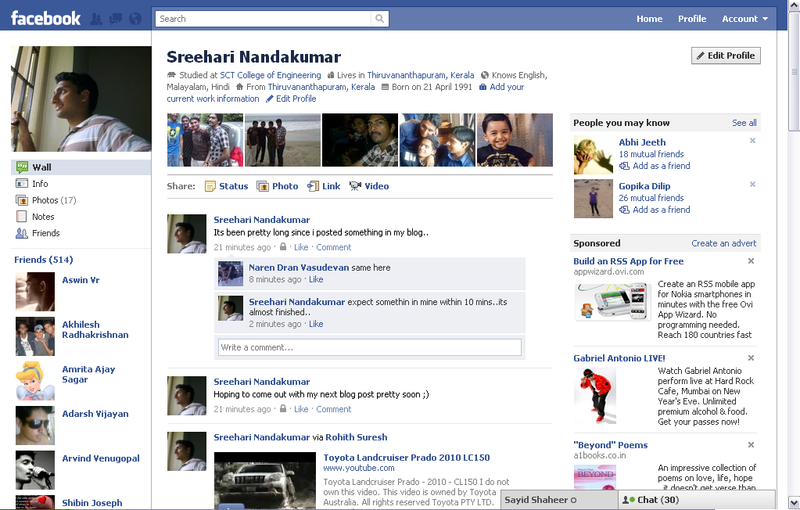 But since the coming of facebook and twitter the time I allocated earlier for blogs reduced drastically. I spend many hours on facebook and twitter alike. So essentially the gap between successive posts began to increase. But the fact of the matter is that, I’m not the only one affected by this phenomenon. Many of my fellow bloggers have also accepted this fact and even those which I follow don’t seem to get updated regularly as they used to be in the past. Of course blogs of various journalists and other commercial blogs that I follow still are doing well. So the reasons are quite clear. There aren’t much…its simple, my attention has been diverted from blogging to other kinds of online experiences like facebook and twitter which seem to have more audience than what I get in my blogs. But I still relish the sort of satisfaction and charm that blogging has to offer to me. I could never have conveyed all this through my facebook or twitter account. Cool !! Buddy !! 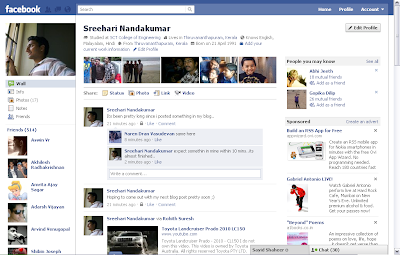 lukin fwd to more blog posts !!! nice to see you back bro, half the other blogs i follow seem dead now... good post! Keep writing...! You got a good wrting skill, don't spoil it. My wishes. wow ! i really repent for nt visiting u r blog till nw ..... keep posting buddy ! u have excellent blogging talents da.